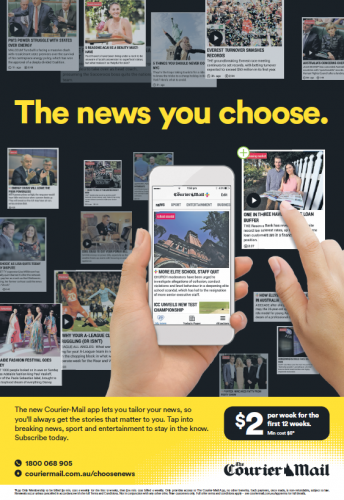 As part of News Corp Australia’s strategy to accelerate growth in digital subscriptions, customers are being offered the option of an app-only subscription for all four metro titles – The Daily Telegraph, Herald Sun, The Courier-Mail and The Advertiser – for the first time. Complementing the recent upgrade of News Corp’s metro apps for mobile and tablet, the new app-only subscription offer is expected to deliver incremental growth in an expanding market of customers willing to pay for quality news journalism. Damian Eales, News Corp Australia’s chief operating officer for publishing, said: “Continually improving the customer experience, and making news more accessible to more customers is an important part of our growth strategy. News Corp Australia’s chief digital officer, Nicole Sheffield, said: “Strong investment in our digital products to enhance the customer value proposition and extend our audiences is a clear strategic focus. The new metro apps offer features like news feed personalisation, news alerts and notifications, access to live news updates, live sport scores, videos, and interactive daily crosswords – all at a new, low price point. The four-week above-the-line campaign includes metro and community press ads, targeted display, mobile display and video through inMobi, and out-of-home ads on bus interiors through APN Outdoor in Sydney, Melbourne, Brisbane and Adelaide.